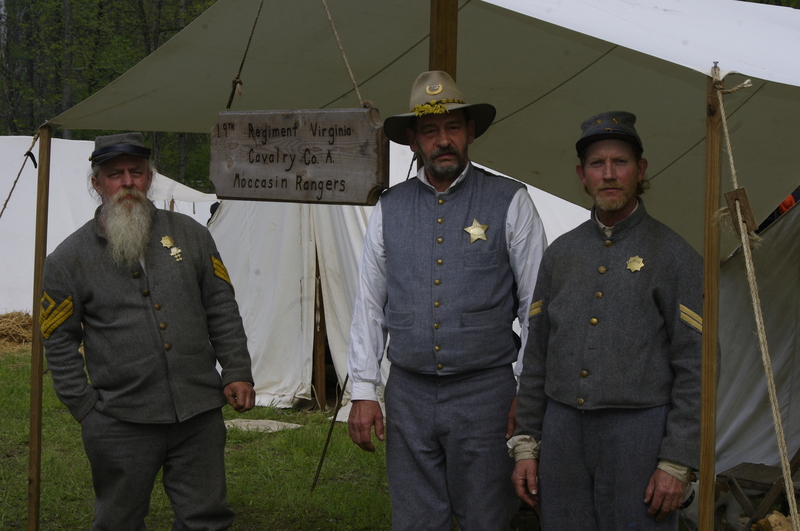 19th Regiment Virginia Cavalry, Company A, also known as the Moccasin Rangers. Skirmish on the River at Gilbert, West Virginia, 25 April 2015. Just before Brandon and I left, Ugee told us about the last time she saw Ed. It was the late 1940s and he lived on 45th Street in Ashland. Aunt Rosie Day made the trip with her, but warned her that the chances of hearing any music were slim because Ed and Ella had played little music since Ralph’s death. Ed whispered to Ella, “Watch this,” then went all out for “Calhoun County Blues”. Ugee took off dancing and Ed “got to laughing” and then fiddled up a storm. “That’s the first time they’s been any laughing and going on in this house since Ralph died,” Ella said. Ugee’s visit apparently cheered Ed and Ella up, because they tried to get her to stay all summer. Ed told her, “That’s what we need down here,” but she teased them about being “dead people” and said she’d never do it. As Ugee spoke about her life, I pulled out the Laury Hicks fiddle and began to play. For Ugee, hearing it painted pictures and conjured up images from long ago. Her eyes teared up, full of emotion and melancholy. “I never thought I’d hear Dad’s fiddle played again,” she said, after I played one tune. Did they play “West Fork Gals”? Before putting the fiddle back in the case, I asked what Ed did when he needed repairs on his fiddles. Did Ed trade fiddles a lot? Brandon asked Ugee about her father’s background, a very important thing considering his strong presence in Ed’s life. She said he was born in 1880 to Washington and Elizabeth (McCune) Hicks in Calhoun County. Ugee spoke little about Laury’s bachelor days but implied that his musical skill and talent at square dancing made him popular with the ladies. “They wouldn’t have a square dance in the country without having Laury Hicks,” she bragged. “All them McCunes could play music and they could dance, too,” Ugee said, before adding that they were mostly known as singers. There was an old man, he had a wooden leg. Ugee couldn’t remember the title of her grandfather’s favorite tune, nor any more words to it, but Brandon later found those lyrics in a song recorded by Gid Tanner and His Skillet Lickers called “Hinkey Dinkey Dee”. Around that time, as Billy and Brandon wandered in the woods of eastern Kentucky, I called Jimmy Triplett, a fiddler and protégé of Doc White in West Virginia. Doc, in addition to being Ed’s friend, was a jack of all trades — fiddler, doctor, dentist… I’d recently heard that he was a photographer and wondered if maybe he had pictures of Ed or Laury Hicks. Jimmy wasn’t really sure. What kind of tunes did Doc play? Jimmy played a tape over the telephone of Doc talking and playing “Pigeon on the Gate”. Jimmy referred me to John Morris, an Ivydale-area fiddler who’d known Doc and even learned “Pigeon on the Gate” from him. John was too young to remember Ed personally (he was fifty-something) but had heard a lot of stories. John said stories abounded about Ed among the people of Calhoun County. It was coincidental that John would mention Ed’s profanity. A few days later, Brandon met a niece to Johnny Hager at a genealogical meeting and she said Johnny quit traveling with Ed because he used foul language and because he had another woman in Calhoun County. Supposedly, when this woman died Ed played the fiddle at her grave all night. This “other woman” story may have had some merit: Wilson Douglas told me that Ed had an illegitimate daughter in that country. The next day, at the fiddling contest, Brandon met George Carr of Madison, West Virginia. George said Ed was the reason he started playing the fiddle many years ago. We hadn’t played long until Slim was telling me more about his background. Slim said his dad played “The Old Lady Carried the Jug Around the Hill” and “Girl With the Blue Dress On”. Here comes the girl with the blue dress on, the blue dress on, with the blue dress on. I asked him if his father played “Catlettsburg” and he said yes, although it was not the same version as what Ed played. Every now and then, Slim would tell me something about Ed. Slim began talking about his own career in music, mostly his Depression-era radio work. He mentioned working with or meeting people like Bill and Charlie Monroe and Earl Scruggs and even credited himself with bringing “Orange Blossom Special” to Charleston from Atlanta in October of 1938. He kind of caught us by surprise when he spoke of having played all through the Guyandotte Valley. Later that night, Brandon and I found some more family photographs in a box at Pat Haley’s. One was of Ella, while others were of Margaret Arms. Margaret was a real “mystery lady”: nobody seemed clear on her relationship to the Haley family. Lawrence Haley had remembered her as a cousin to either Ed or Ella, while Mona called her “Margaret Thomas” and said she lived in Cincinnati.